On a warm autumn Saturday early evening, James Beard celebrity chefs gathered to cook alongside the highest caliber local chefs for “Cookin’ in the Bluegrass,” as part of the James Beard Celebrity Chef Series for the World Equestrian Games. 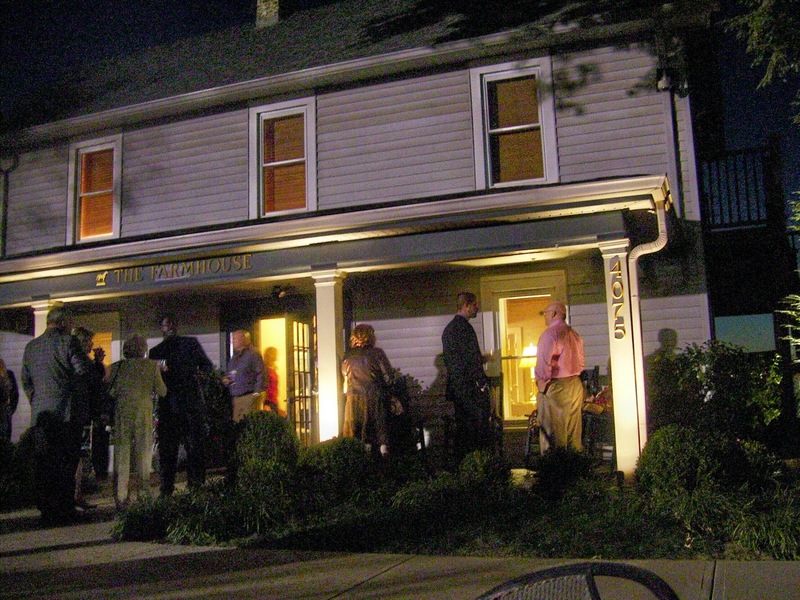 They gathered in the kitchen of The Farmhouse to spotlight Kentucky food and ingredients. 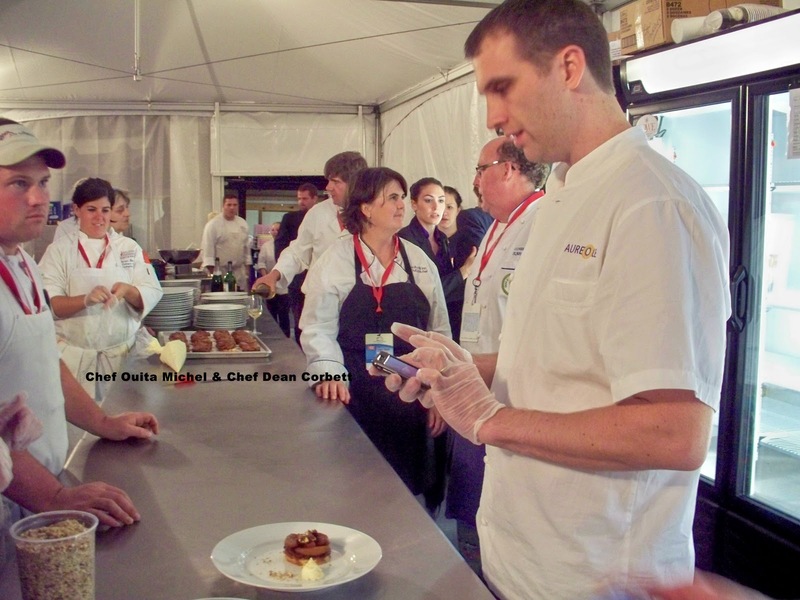 Chef Michael Cimarusti, partner and Executive Chef of Providence, Los Angeles, California is a 2010 James Beard Award Winner. Chef Christopher Lee, Executive Chef of Charlie Palmer’s Aureole, New York, New York was a 2006 James Beard Award Winner and earned two Michelin Stars at Gilt Restaurant in New York before taking over the kitchen at Aureole. Chef Dean Corbett, Corbett’s, Jack’s Lounge, and Equus, Louisville, Kentucky is an institution in the local culinary community. 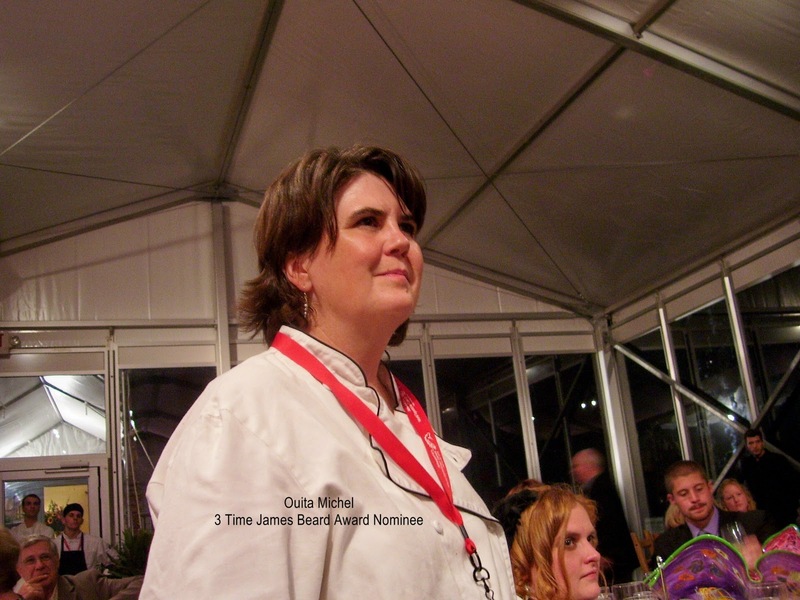 Representing Holly Hill, Midway, Kentucky, was three-time James Beard Award nominee Ouita Michel. From the very first sip of wine and nibble of food to the last toast with dessert, the evening was a tremendous success. Precisely at 7 p.m., the corks popped on the front lawn for a Kentucky Wine Tasting, featuring Elk Creek Vineyards and Equus Run Vineyard and Winery. Inside the lobby of The Farmhouse, Maker’s Mark Specialty Cocktails and Kentucky Bourbon Barrel Ale were served from a wax-dripped Maker’s Mark Bar. We sipped cocktails and mingled with the crowd while servers glided in and out with trays of passed hors d’ oeuvres. Chef Dean Corbett offered local Kentucky Bison Tartar served on on tiny crisp crostini. It was highly seasoned with flecks of fresh herbs, very lean, and rich. Happy Jack’s Savory Pumpkin Beignet with Sapori d’ Italia Aged Goat Cheese came nestled on tiny china plates with bite sized deep fried pumpkin beignets topped with a specks of tangy goat cheese. It was a fascinating flavor profile. Our favorite server of the evening, Marie, carried a long rectangular china serving platter with individual tasting spoons of House Cured Guanciale (cured pork jowls), with Maker’s Mark 46 Bourbon and Green Apple. 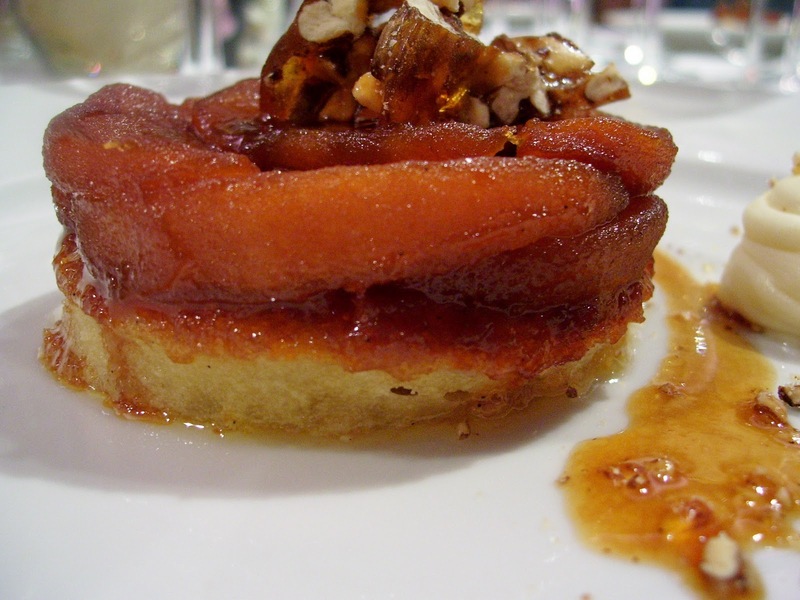 The crisp tartness of the apple provided crunch and acid for the Italian bacon. I loved the delicate fresh chervil garnish that enveloped the pork jowl bites. Marie hawked them as “the best bacon you’ll ever eat.” I ate seven. Ouita Michel is famous for her shrimp and grits. Saturday night, she prepared a deconstructed passed hors d’ oeurvres version of it with Kentucky Raised Freshwater Shrimp and Grits. Perched atop tall shot glasses of grits essence was a skewered ham cube, scallion, perfectly cooked shrimp, and fried cheese grits cubes. It tasted like a bowl of shrimp and grits in one bite-shoot-and-swallow motion. Salty and sweet with major corn impact. I wanted more. As the sun began to set under a gorgeous Kentucky sky, we were called to dinner. We made our way into The Farmhouse, through the lobby, out the back door, past the Governor’s Garden, and into the glassed-in dining room. Each table had 64 pieces of stemware for eight guests. I know. I counted. with dollops of chilled pureed butternut squash, green apple, endive, and Kentucky Bourbon Barrel Ale. Toasted pumpkin seeds added crunch while tender greens provided freshness. Sporting a nod to molecular gastronomy, the individual pockets of jellied flavor exploded when sliced. Individually, they didn’t make sense and were too intense. But, when swirled together like a Jackson Pollack painting with bits of scallop shashimi, they became a unified whole. 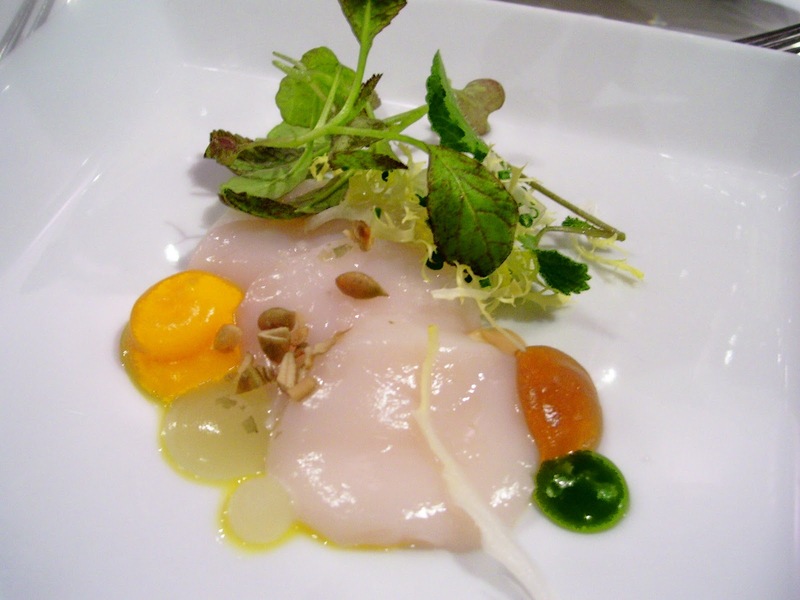 The buttery soft briny sea scallops soaked up the vibrant endive, tart apple, and velvet squash. It was smart and clean. A perfect beginning. In complete contrast to the first course, the bluegrass moussaka was earthy and deep. 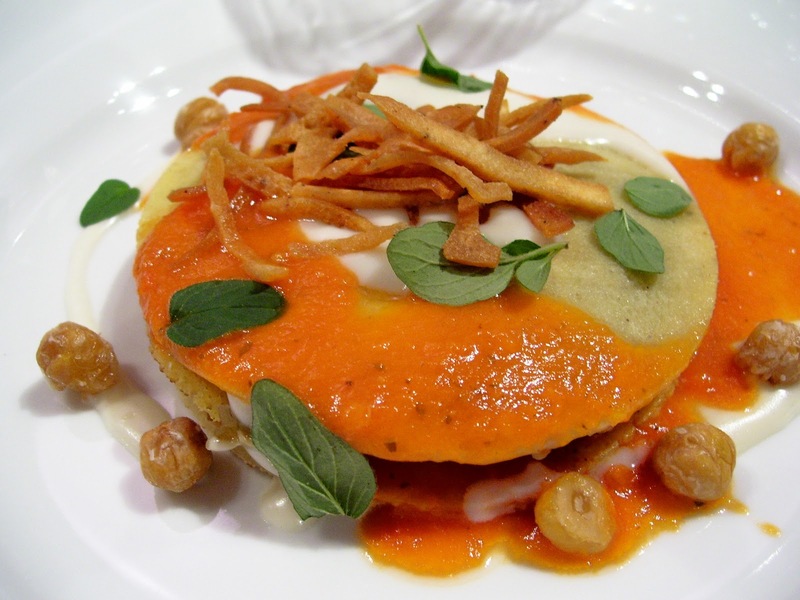 Socca crepes are made from ground chickpeas forming light-as-air pancakes. The crepe had the texture of a soft thick corn tortillas. It was an utter surprise with its fluffy texture perfectly draped over fork tender braised local pulled lamb mixed eggplant caviar. Napped with cream and fresh tomato coulis, it was sophisticated comfort food. Fried chickpeas tumbled by the side added crunch and earthiness. 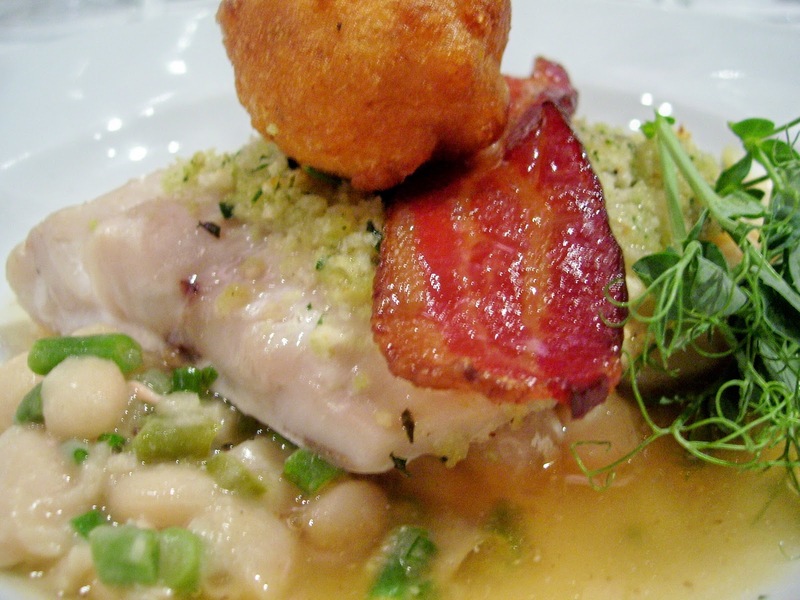 The sea bass arrived on a bed of tender slow cooked cannellini beans in a pool of corn broth topped with smoked bacon and a fried corn fritter. It was moist, mild, and flaky. It held up to the robust hardiness of the beans, the smoky saltiness of the bacon, and the transparent corn broth. The fluffy fresh corn-studded fried fritter punched the corn flavor through while the bacon actually provided a meaty heftiness to the dish. The mouthfeel was velvety until the crackling bacon crunch. Although I would have loved to have had a lemon squeeze for a bit of acidity, it was boldy seasoned and fantastic. That being said, the bright acidity of the Ruffino Chardonnay provided the needed lift. The sea bass was a huge crowd favorite. Bacon makes everything better. The roasted squab was cooked to a perfect pink with crackling skin bathed in a sweet Maker’s Mark 46 bourbon glaze. It was a tiny thing with just a bit of meat. With permission from our tablemates, we all ate it with our fingers, gnawing every bit of flesh from the bones. Like animals. Maybe it was the wine. Nope, it was the delicate tender rich bourbon-glazed squab. There was enough squab jus puddled on the plate to swipe the meat through for unnecessary added richness. 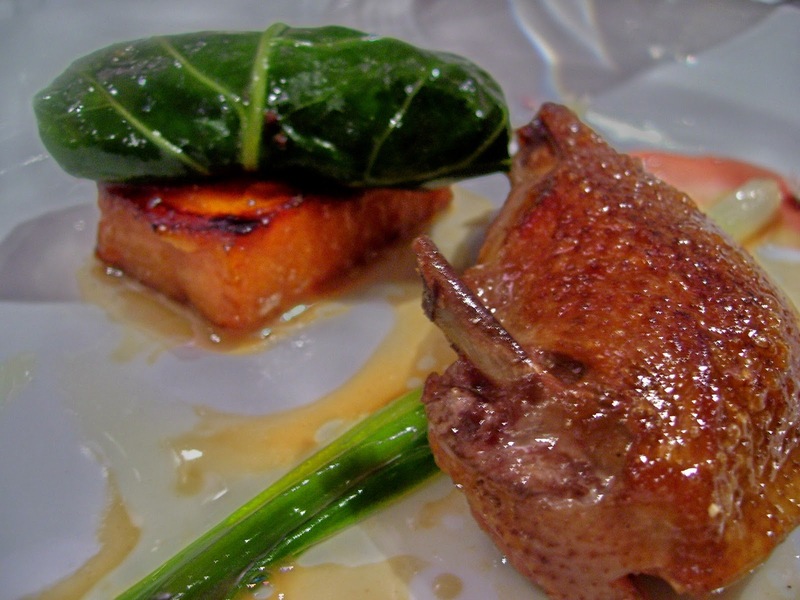 A cubed sauteed caramelized sweet potato sat next to the shiny squab. With a mad stroke of culinary genius, Chef Michael Cimarusti perched a fois gras and ground squab stuffed collard green bundle on top of the sticky caramelized sweet potato cube. Speechless. The three cheese selections represented the finest from Capriole. Served in a ripening succesion from soft and tangy to to aged and nutty. Splendid. Pear compote was passed as an optional topper. It was a nice respite with calming flavors accentuated beautifully with sparkling dry Veuve Cliquot. Individual Apple Stack Cake with Scott County Hickory Nut Brittle and Maker’s Mark Bourbon Caramelized Evan’s Orchard Apples. How could life have gotten any better? Shortbread topped with deeply caramelized sticky apples with a scoop of pristine fresh whipped cream to the side, that’s how. Better, yet? Crunchy black hickory nut brittle scattered over the top. Again, speechless. I’m not a big dessert eater. I inhaled it. The shortcake had complete soaked the sugary sweetness from the caramelized apples. Think inverted gooey pineapple upside down cake (without the cherries). It had that essence. Unbelievable. The guests chefs came out to thunderous applause and were introduced and presented with traditional James Beard Cerificates honoring the celebration, nurturing, and preservation of America’s diverse culinary heritage and future. We were honored and fortunate to be a part of The James Beard Celebrity Chef Dinner Series: Cookin’ In The Bluegrass. The food was impeccable, the people were joyous, and the atmosphere was electric. We will never forget the evening, the meal, the service, the hospitality, or the experience. 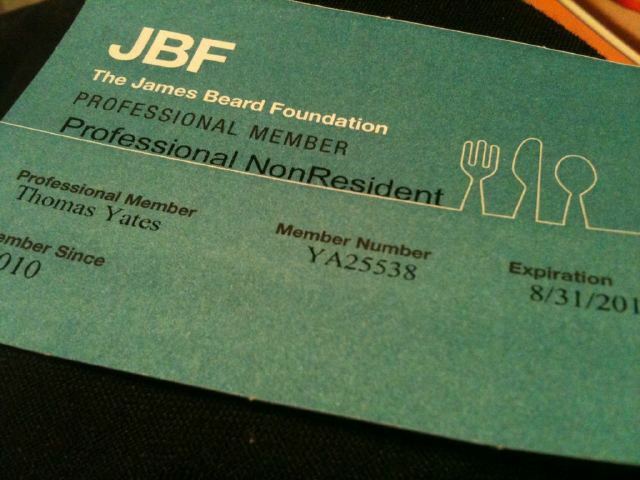 Michael gave me a James Beard Foundation Culinary Professional Membership for my birthday. Last night, we were invited to stop by the James Beard House the next time we are in New York. We will.